Raumfahrt+Astronomie-Blog von CENAP - Blog: Mars-Chroniken - Mars-Rover Curiosity macht Beste Sonnenfinsternis Fotos von Phobos! 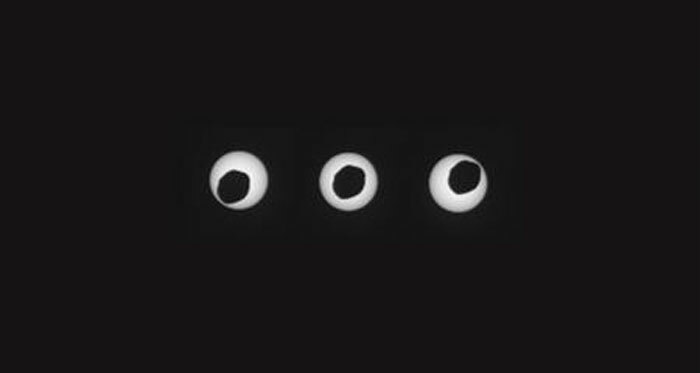 This set of three images taken three seconds apart by NASA's Curiosity rover shows the larger of Mars' two moons, Phobos, passing in front of the sun on Aug. 17, 2013. 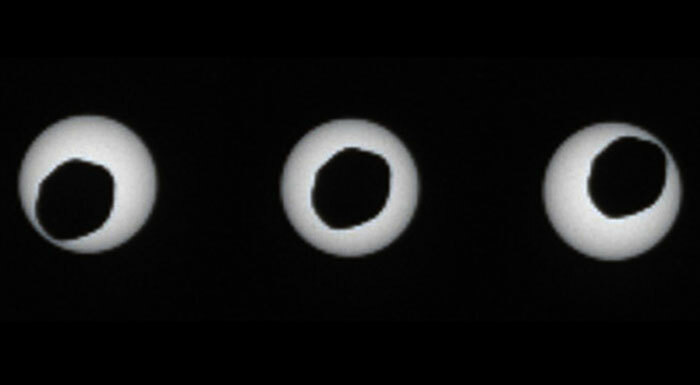 NASA's Mars rover Curiosity has captured the sharpest-ever images of a solar eclipse as seen from the Red Planet. The 1-ton Curiosity rover snapped pictures with its telephoto lens as Phobos, the larger of Mars' two tiny moons, blotted out much of the solar disk on Aug. 17. "This event occurred near noon at Curiosity's location, which put Phobos at its closest point to the rover, appearing larger against the sun than it would at other times of day," Mark Lemmon of Texas A&M University, a co-investigator for Curiosity's Mastcam instrument, said in a statement. "This is the closest to a total eclipse of the sun that you can have from Mars."